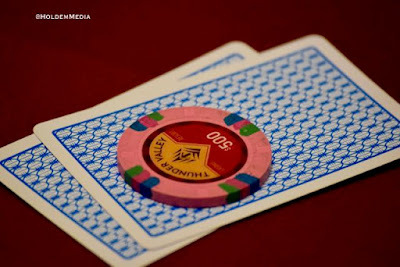 The Poker Room at Thunder Valley Casino Resort | Lincoln, CA: Who Is Still Hunting Bounties? Who Is Still Hunting Bounties? Ryan Laplante, Kevin O'Donnell, Joe Nguyen, Kyle Kitagawa, Darrell Steed, Scott Ball, Rafael Gonzalez, David Olson, Cy Williams, Mike Harvey, Paul Brown, Dana Muse, Amber Chatwin, Matt Boddorf, Quyen Hoang, Babe Prescott, Marty Gorenc, Chris Penfield, Gary Pisarek, Sean Drake, Al Sanchez, Kelly Winterhalter and Donald Landwirth are all still in the $1100 Knockout with $500 Pink Chip Bounties.